Mariah Carey is ready to make you her Valentine, and she's doing it on MTV! Mimi will stop by MTV on Wednesday (February 12) at 7:50 p.m. ET/PT to debut her newest music video for "You're Mine (Eternal)" just in time for Valentine's Day. After the premiere, the video will be available on her MTV Artists page along with spots on MTV Hits and MTV Jams. Lambs will not only get a video premiere, but an interview with MTV correspondent Sway Calloway. An extended interview will take place online at 8 p.m. on MTV.com. 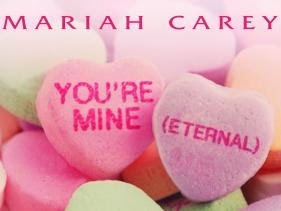 "You're Mine (Eternal)" is off Mariah's new album The Art of Letting Go,out May 6. The song, written and produced with Rodney Jerkins, follows up the singer's collaboration with Miguel, #Beautiful. So grab your candies, teddy bears and all things sweet and get ready for Mariah's new music video. You won't want to miss Mariah Carey on "MTV First" on Wednesday 7:50 p.m. ET/PT.